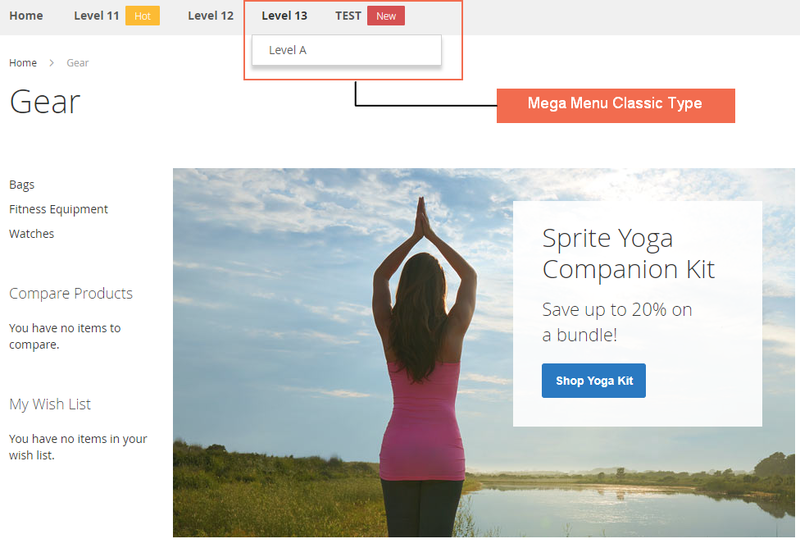 Magento 2 Mega Menu Extension allows admin to design menu for better website navigation. Mega Menu for Magento 2 free extension is helpful for admins to take control of the menu. Shop owners can create and customize the mega drop-down menu to provide online users with visible and super-easy navigation. This well-designed Magento 2 Mega Menu extension is the cooperation between BSS Commerce team and BSS Themes team for the best user experience. You can take full use of three sub-levels of Magento 2 Mega menu free extension to navigate web visitors to whatever they want so that customers can reach and purchase their favorite items with ease. Magento 2 Mega Menu extension provides category listing, classic, and content types to help store owners create menu list with the professional look and rich content. "Content" option to include various content blocks in different positions of the submenu. Under the mega content menu, you are easy to create and arrange new blocks in 5 positions under the sub level. They are Content Block, Top Static Block, Left Static Block, Right Static Block, Bottom Static Block. 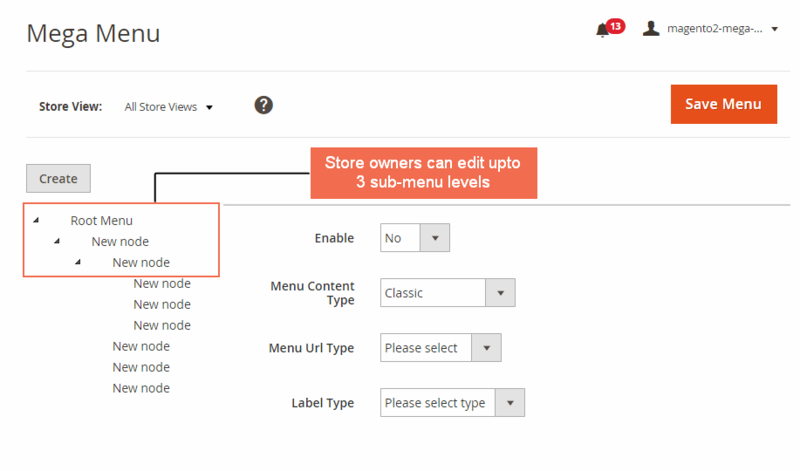 Please note that Magento 2 Mega Menu Content type is available to the first sub-menu only. "Classic" option to display three levels of sub-menu straightforwardly. With the support of the mega menu classic feature, all sub-items are expandable in one big drop-down area so that customers can have a quick view of the entire websites and they are likely to click for more. Similar to Magento 2 Mega Menu Content type, you can add blocks in different areas of the sub-menu level such as Top Static Block, Left Static Block, Right Static Block, Bottom Static Block. Moreover, sub-items are shown in the category listing view. Insert labels such as Hot, New, Sale to highlight the mega menu. Using Magento 2 Mega Menu free extension, you can draw customers’ attention to the sub-menu with catchy labels and trigger them to explore more. Besides various blocks, Magento 2 Mega Menu extension also supports adding a custom link or category link to created sub-items. You can bring customers to any pages as wanted. In the backend, you can manage all mega menu levels within few clicks. Why Magento 2 Mega Menu is your Must-have extension? With the help of Magento 2 Mega Menu free extension, online shoppers will find the most accessible path to go through sites while by the default classic navigation, customers need multiple clicks to reach contents or products. Expandable mega menus will show all information one panel and use icons/other graphics. Hence, customers explore faster no matter where they are on your pages. It is no doubt that people always pay more attention to well-designed websites. A professional and beautiful navigation bar is the first thing you should do to attract customers because it displays everything at a glance. Mega Menu provides room for a short description of offerings. It is very beneficial when a new customer comes to your website. I installed your extension and it is working nicely. But there i not able to sorting order of menus or sub-menus. Please can you suggest solution me for that. I installed your extension and it is working nicely. But there i found that i can not change sorting order of menus or sub-menus. Currently we have to delete menu and then Create where we want to show. I love Mega Menu for Magento 2 of BSS Commerce. It is not only free, but it is awesome as well. It has features which i need for my site. I can customize to get what i want. Thank BSS a lot! I am very satisfied with this website's team and extensions. They have not made me disappointed since the day i purchased the first module. Mega Menu for Magento 2 is no exception. Thanks BSS's team!